20th Century Fox has been steadily releasing character teasers for X-Men: Apocalypse. Yesterday, we got profiles for three of the Four Horsemen, including Storm, Psylocke and Magneto. 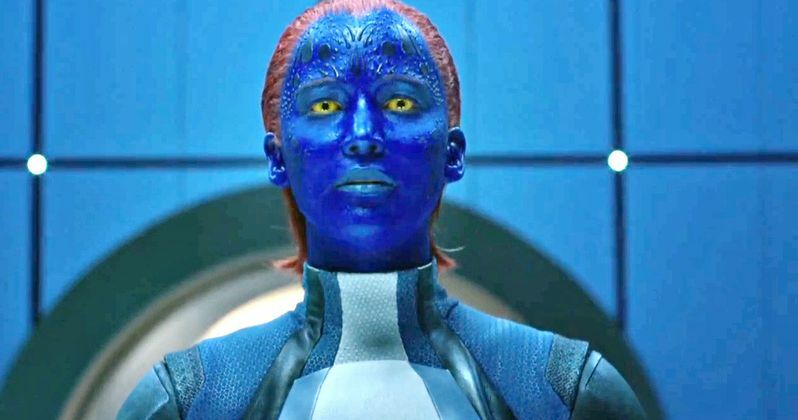 Now Jennifer Lawrence's Mystique gets the spotlight as this once and future villain becomes a leader transformed. She will team up with Professor X to battle the title villain in theaters everywhere this Memorial Day. X-Men: Apocalypse closes out the prequel trilogy that includes 2011's X-Men: First Class and 2014's X-Men: Days of Future Past. Since the dawn of civilization, he was worshiped as a god. Apocalypse, the first and most powerful mutant from Marvel's X-Men universe, amassed the powers of many other mutants, becoming immortal and invincible. Upon awakening after thousands of years, he is disillusioned with the world as he finds it and recruits a team of powerful mutants, including a disheartened Magneto (Michael Fassbender), to cleanse mankind and create a new world order, over which he will reign. As the fate of the Earth hangs in the balance, Raven (Jennifer Lawrence) with the help of Professor X (James McAvoy) must lead a team of young X-Men to stop their greatest nemesis and save mankind from complete destruction. Reprising their roles from X-Men: First Class and X-Men: Days of Future Past are Nicholas Hoult (Beast), Rose Byrne (Moira McTaggert), Evan Peters (Quicksilver). New cast members include Oscar Isaac as the villainous Apocalypse, Olivia Munn as Psylocke, Sophie Turner as Jean Grey, Alexandra Shipp as Storm, Tye Sheridan as Cyclops and Kodi Smit-McPhee as Nightcrawler. The movie will also mark the long awaited return of Hugh Jackman as Wolverine! Bryan Singer is directing X-Men: Apocalypse from a script by Simon Kinberg, based on a story the director and screenwriter crafted together with X2: X-Men: United writers Dan Harris and Michael Dougherty. There have been rumors that Bryan Singer has signed on to direct another X-Men movie, with production reportedly starting next year in Montreal, but that hasn't been confirmed yet, although the studio is also developing spinoffs such as The New Mutants, X-Force and Gambit. Some of the new characters seen in X-Men: Apocalypse may return in New Mutants. Along with the Mystique featurette, we've also included the power pieces for Storm, Magneto, Psylocke and Angel, the later of which debuted earlier in the week. Psylocke makes her X-Men franchise debut in X-Men: Apocalypse, with Olivia Munn explaining in this video from the 20th Century Fox YouTube page that her character is very lethal and "isn't afraid to get her hands dirty." We also see new footage of this powerful mutant in action, who will surely be a force to be reckoned with in X-Men: Apocalypse. Alexandra Shipp reveals that Storm has a "darkness" to her that Apocalypse (Oscar Isaac) brings out, making her more powerful. We also see footage from a scene that was previously teased in early concept art, where Storm battles Jean Grey (Sophie Turner) and Cyclops (Tye Sheridan). The Magneto profile has Michael Fassbender teasing that his character teams up with Apocalypse to destroy the human race. And the featurette on Angel introduces Ben Hardy as the popular mutant for the first time. So strap yourself in and hold on. This is going to be one big 80s nostalgia blast that you don't want to miss.